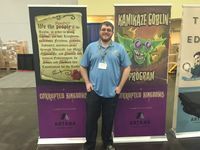 Raymond Chandler III is a board game designer, and member of the Columbus Area Board Gaming Society and Design Club from Columbus, Ohio. He has published two games. His first, Corrupted Kingdoms was published by Artana in 2016. His second, City of the Big Shoulders was published by Parallel Games and Quined Games in 2019.